It is the phrase most used these days: See you at FITUR !!! A new edition of the International Tourism Fair is coming. From January 23 to 27 we will meet at IFEMA venue in Madrid. The 2019 edition expects more exhibitors, greater national and international presence, increases its space and wants to rise the 251,000 visitors of 2018. That is, it can break records. 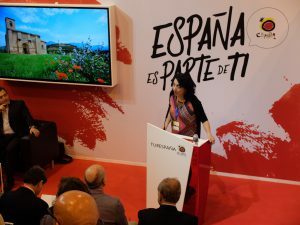 The members of Spain and Food Wine Tourism Association will take the opportunity to talk about 2018, share the projects of 2019 and make many visits!!! We want to emphasize that Spain is fashionable! All the agencies of the association have worked very well 2018 and we can say that we detect a growing interest in the foreign traveler to visit our country. The international visitor is attracted by culture, wine and Spanish gastronomy. We collaborate with Wine Tourism of Spain and TourSpain and we have many ideas to continue carrying out together actions to increase the number of visitors to our country. We invite you to go to FITUR and discover the huge variety of tourist destinations. See you in FITUR !! !